Three nice runners at Caulfield on Saturday when Barthelona, Strike Force and Eagle Ridge go to the races. Strike Force is the first to go in race three, the MyPunter Handicap (1600m) where he will be ridden by Liam Riordan and jump from barrier two. It will be the third run this preparation for Strike Force and Mike Moroney feels has conditions to suit. “He’s drawn nicely and we’ve claimed on him,” Moroney said. “There has been a little bit of rain to ease the going and if he can jump and settle just behind the lead then I do think he can run a big race. Eagle Ridge runs in race eight, the VOBIS Gold Reef (1600m) with Patrick Moloney to ride and drawn barrier three. 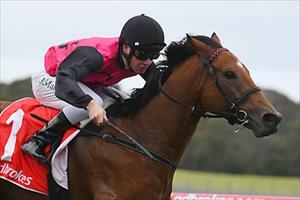 The three-year-old finished sixth at Sandown on July 18 making up good ground over 1400m. “It’s a valuable race so we are happy to try him on the quick back-up,” Moroney said. “He certainly appears to have come through the last run well. “He’s bouncing at home and eating well so we’re happy to let him take his chance. Barthelona (pictured) runs in the last race of the day, the Farewell Mike Symons Handicap (1400m) with Zac Spain to ride and drawn barrier one. “We want to use the gate if we can,” Moroney said. “Ideally he can bounce and we’ll run them along. “There does not appear to be a huge amount of speed in the race and if he can get a reasonably soft lead with his low weight then I think he will give them something to chase.